It’s not a question of if, but when. 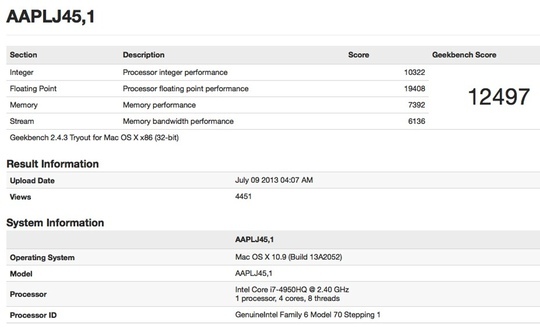 Apple will release Haswell MacBook Pro models this year and, given what we know about the Haswell MacBook Air (i.e. superb battery), the anticipation is absolutely palpable. So, is a Geekbench score of 12,497 for a 15-inch portable worth crowing about? Perhaps, yes. The interesting twist here is that Geekbench founder and chief guru John Poole notes that the model listed only has integrated graphics, which likely means that Apple plans a higher configuration with a faster processor and discreet graphics. So, this 12,497 score portends even better, faster Haswell MacBook Pro things to come. And, of course, as Tapscape’s MacBook Air meta review noted, Intel’s Haswell architecture is all about battery performance, up to 80 percent longer (and thicker with ribs). So, whatever Geekbench performance we see in these preliminary Haswell Macbook Pro results likely will be underpinned by all-day, or near all-day, battery life in a pro-grade laptop. Additionally, there is also the open question of Haswelll-powered Retina MacBook Pro models, which could be game changers in their own right.